In this three-part article about how to turn a baseball game stop into a vacation, Fancation, we take you to the Bronx, Yankee Stadium, and the adjacent exciting borough of Manhattan. Enjoy the ride! Red white and blue may be the colors representing our nation but in the Bronx, it’s all about the blue and white—pinstripes. Hop on the number 4 Train going Uptown when the Yankees are playing at home and the sea of pinstriped jerseys and New York Yankees caps is overwhelming. The original “House That Babe Built,” -- the nickname for the old Yankee Stadium famous for housing Babe Ruth during his impeccable reign as a Yank -- is no more but the Bronx Bombers’ new stadium welcomes the 27 World Championship team with pride. Since the first game on April 18, 1923, Yankee Stadium has hosted more than 37 World Championships and has gone through a lot of remodeling in order to accommodate its continually growing fan base. The most recent and extensive has been the demolition of the old stadium and the complete construction of a new one, the most expensive baseball stadium ever built, just across the street. 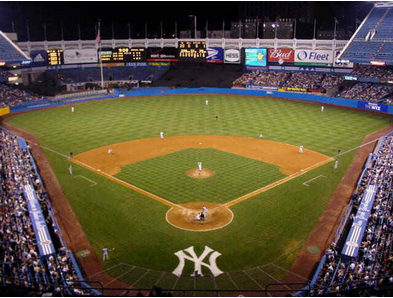 The three-year-old Yankee Stadium seats 50,287 and offers about one dozen restaurant and dining options including the sit-down Hard Rock Café and NYY Steak. If you want a meat fix to take back to your seat, try Carl’s Steaks for a decent Philly cheesesteak or Lobel’s Steaks for a New York no-cheese version. There are also a sushi bar, Cuban sandwiches, fried dough, Mexican nachos and guacamole, and the baseball-stadium requisite garlic fries, pretty much reflecting every local taste preference. But what I’m most excited about this year is that Torrisi’s Parm has a stand in the Great Hall between gates 4 and 6 where the meatball parm will truly blow your socks off. When planning where to sit, behind the dugout is always popular but ridiculously expensive, so consider a real fan experience and opt instead for the bleachers. Here you can do the “Roll Call” with the Yankees’ own unofficial cheerleaders, the Bleacher Creatures. At every game since the late 90s the rowdy bunch chants the players’ names as each enters the field and do so until the player acknowledges them with a wave or a thumbs-up. If you enjoy a good sing-along prepare to belt out Frank Sinatra’s classic “New York, New York” at the end of each winning game. Be sure to visit Monument Park before the game (leave a lot of time because of the long lines) and pay homage to some of the best baseball players to ever suit up in pinstripes-- Joe DiMaggio, Mickey Mantle, Lou Gehrig and, of course, Babe Ruth. This entry was posted on Thursday, September 27th, 2012 at 2:23 am	and is filed under Stuff to Do. You can follow any responses to this entry through the RSS 2.0 feed. You can leave a response, or trackback from your own site.